Brinicombe Equine Think Pink is a broad spectrum formula which includes specially selected vitamins and minerals, probiotics to support the digestive system and pure linseed oil for improved coat condition. It can be difficult to ensure your horse is receiving the correct concentration, and if it is unbalanced then your horse's digestive system's condition, performance and health will suffer. When fed daily, Think Pink can help to maintain the natural micro-flora of the gut which provides optimal health and digestion, while the included nutrients promote natural vitality, condition and a glossy coat. Maize gluten feed, sodium chloride, lithothamn, calcium carbonate, mono-calcium phosphate, linseed oil. Mix with a damp feed, gradually building up to the required rate over seven days. 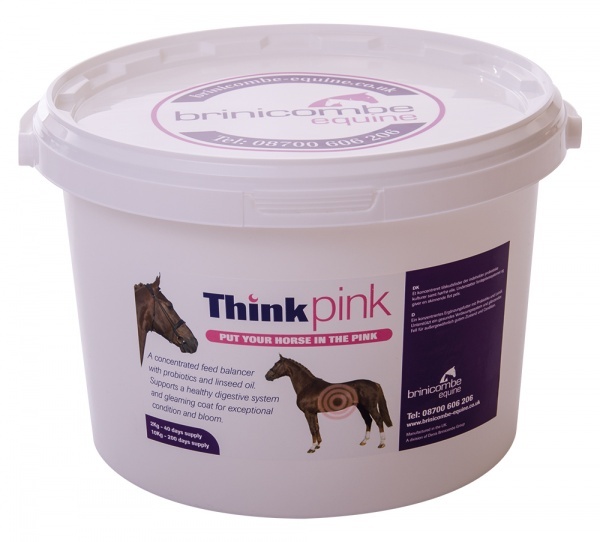 There are currently no questions for Brinicombe Equine Think Pink for Horses - be the first to ask one!